Total sweetness! And perfectly colored! And I love the added details on the envelope! Totally adorable! Love how you've used that circle frame to draw focus on the adorable foxies! And I absolutely adore that little birdie on the envelope, such a cute idea to match the card! 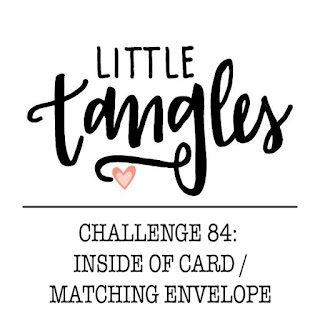 Thank you so much for joining us at the Little Tangles challenge! Oh these foxes are just too cute! Love them! Your colouring is amazing!!! The envelope looks so sweet too! This will definitely warm someone's heart! This is so cute! Those little foxes are adorable! How sweet this is! The colors are fabulous! Adorable card, I love your sweet little foxes. I totally knew you needed something to do with those dies, lol!!! What a fun card this is!